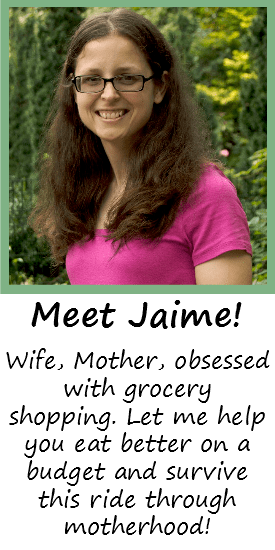 Would you like to have extra spending money every month? Maybe treat yourself to Starbucks, or use it to stock up on grocery essentials? 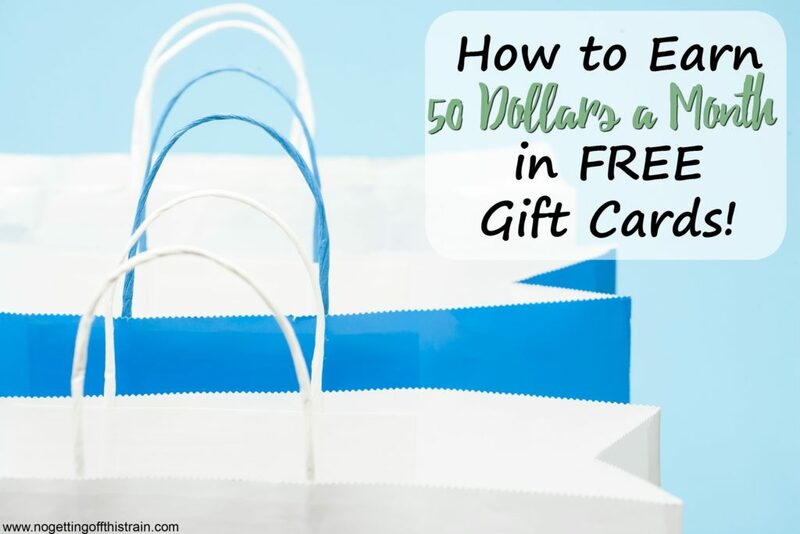 It’s totally possible with just a few minutes a day; in fact, you can easily earn up to 50 dollars a month in free gift cards with one simple tool: Swagbucks! I’ve been using Swagbucks off and on since 2012, and really started harnessing its power in 2014. During this time, I used it to help pay for Allison’s baby formula, to buy me a new Fitbit, and to help me buy bulk items every month at Sam’s Club! Let me show you, step-by-step, how you can earn 50 dollars a month in free gift cards to use for whatever you want. Swagbucks is a website that lets you take surveys, watch videos, and complete special offers to earn “Swagbucks”, which are points you can use to redeem gift cards. With the exception of certain special offers, everything is completely free and does not require personal information. The amount of Swagbucks you receive depends on the activity. Let me show you what I do daily! If you complete 6 out of 8 items on your daily to-do list (shown on the left side of your homepage), you receive a small amount of bonus Swagbucks. At the very least, I do the Daily Poll for 1 Swagbuck and the Daily Crave for 1-2 Swagbucks. This takes around 2 minutes, and earns me around 2-4 Swagbucks per day. This is where I get the bulk of my Swagbucks! This is an app for iPhone and Android which lets you stream videos. For every 5 videos watched, you gain 2 Swagbucks, with a maximum of 10 per day. The great thing about this app is that the videos continuously play, so there’s no need to keep choosing videos. You can also add videos to your Favorites, which you can use to your advantage by choosing the shortest videos, thus reaching your goal faster! 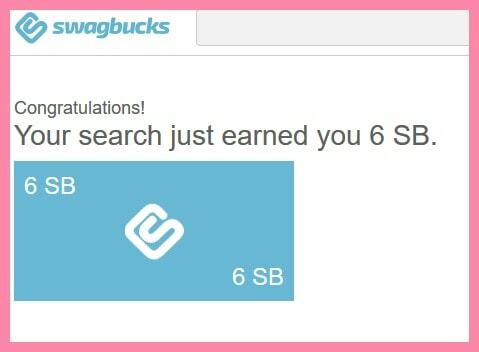 And after you reach your maximum Swagbucks earned for that app, you have a random chance of going into bonus rounds to give you extra Swagbucks! 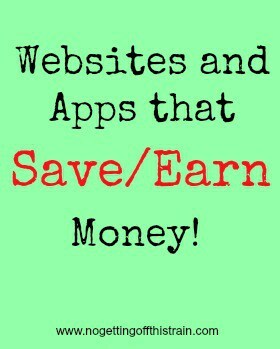 Here is a list of the other TV apps, each of which gives you 10 Swagbucks per day. 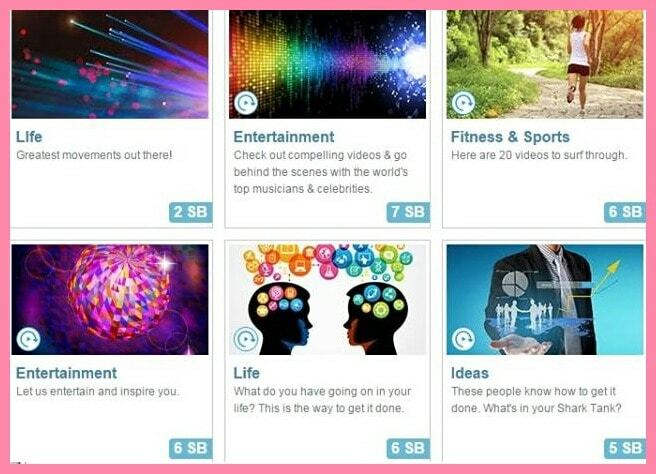 Ncraves are super easy; you click on a series of videos, and you Like or Dislike each video in the series until you reach the end, and you get a certain number of Swagbucks. The lowest you earn per series is 1, and the highest I’ve seen is 10. To make things go faster, click on the pictures that have the little blue and white circle on them. Those are automatic players, and will go through each video by itself until it reaches the end. Just check your computer every 10 minutes or so and restart another series of videos! 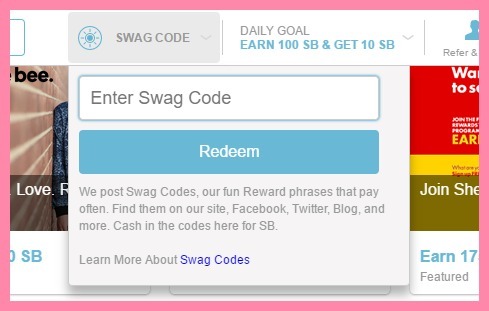 Every day, a new Swag Code is posted, either on the Swagbucks site or one of their social media sites. If you have the app installed or the Swagbutton on your computer, you’ll be alerted to the code and where to find it. The average code is worth 4 Swagbucks. Swabucks has its own search engine! Just use that during the day instead of your usual search engine and you can win, on average, 7 Swagbucks on a random search. I’ve seen people win up to 100 on a search! If you find yourself with an extra 20 minutes every day, you can take a survey, which is one of the best ways to earn Swagbucks. 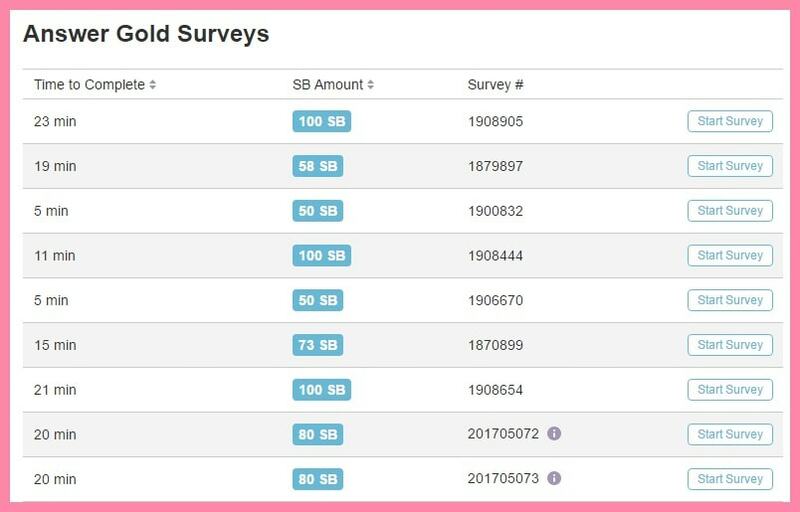 The average survey payout is 50 Swagbucks, but as you can see above, they can also pay over 100 each. These coupons are from Coupons.com and is updated regularly. For every coupon you REDEEM- not just print, but redeem- you receive 10 Swagbucks. It usually takes a couple weeks to get them, but it’s always nice to have like 30 extra Swagbucks turn up in your account. Each day, you have 2 Daily Goals you can reach. 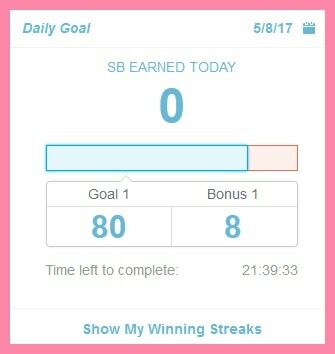 The first one is what counts; hit your first daily goal every day for a full month and you’ll get a 300 Swagbuck bonus! Plus you’ll receive the Bonus Swagbucks each time you hit the Daily Goal. That’s usually another 300 Swagbucks for me. So in a typical day, I earn about 140 Swagbucks. It’s a lot for some, and hardly anything for others. A $25 gift card can be redeemed for 2,500 Swagbucks, so I can usually get about $50 a month just from a little time spent every day! But what if you don’t have that kind of time? 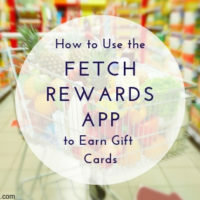 You can still earn gift cards with only 5-10 minutes a day! You can do that for 2 months to get a $5 gift card, or redeem your 300 Swagbucks for a $3 Amazon gift card! It doesn’t seem like much, but every bit counts. You can be as aggressive as you want with Swagbucks: Will you get a couple free coffees every month? Or maybe go all out and try to pay for an entire Disney vacation? Whatever your style, these free gift cards every month can really help! Create an account today and earn a $5.00 sign-up bonus! How do you use YOUR free gift cards? Leave a comment and let us know! I do swagbucks but mine don’t add up very fast at all. Thanks for reading! I’m glad this could help you. =) They don’t seem to add up fast; I just keep myself focused on the daily goal and it seems to go faster! I thought I was signed up with them and then thought I heard they shut down… or was that a different one? LOL I guess I will have to go check that I am signed up and get working! That must be a different one! =) I’ve been part of it since 2012 and it seems to be getting bigger every day! Good question! I think I heard that the 10 SB limit for the SBTV app is only for countries outside the U.S. due to the advertising companies or something. If you’re in the U.S., you should still get 36 a day from the main SBTV app; I just checked and I got the full 36 for today! =) If for some reason you still only get 10 a day, I still think it’s worth it because if you do all 6 TV apps (I need to update this post today with the other apps), that’s still 60 a day and that really adds up over time! I’m well on my way past 10 000 to 25 000 swagbucks. Looking to get at least a cpl hundred in Paypal cash for our 4th annual honeymoon in June :D.